Google Slides can be really useful. It’s a free tool in your Google Drive to create presentations. You can choose from different themes and fonts, embed videos and add animations. You can collaborate with others, and share via email, download etc. The thing I love about Google Drive is the way saving is automatic, something that also makes it very useful for kids. You can even convert PowerPoint Slides to Google Slides and vice versa. As well as working through your browser (I find Chrome is best) there’s an app for your mobile device. We can tell a story via Google Slides by simply writing a narrative, and dividing it into suitable sections. Each slide then has a section of the story. It's a an engaging way to create a digital story, and helps kids learn new technology skills. How do you start? Once you open your Google Drive, choose New, and slide down to Google Slides, choosing Blank rather than From a Template. For my story example, I decided to write about a koala. I made a title page, inserting a title and my name, then inserting an illustration. Next, I added a slide. In this second slide, I deleted the top box where I’d put my title in the first slide, because I didn’t need it. I re-sized the bottom box to make a half page for the text, added a rectangle via Shapes, made it transparent (transparent is found inside the fill pot) and set it to the right for my illustration. I added a border to each box via border dash to the left of the font menu. I wanted to add my own illustrations, but you can search for safe images via Insert, add from the computer, from Google Drive or from a camera. It’s very versatile. I added some leaves and my koala clipart (made with Assembly app on my iPad.) Then I repeated the process, each time adding a new slide via the + top left. Finally I went to Transition and set directions for animating the slides, then I published it to the web. The results should be visible below. If not, you can see it here. Once kids have mastered a simple linear narrative, they might like to try an interactive story, something like a choose-your-own adventure story. This works because Google Slides allows us to embed links and also choose to link to different slides. Here’s a great video with an example and explanation. 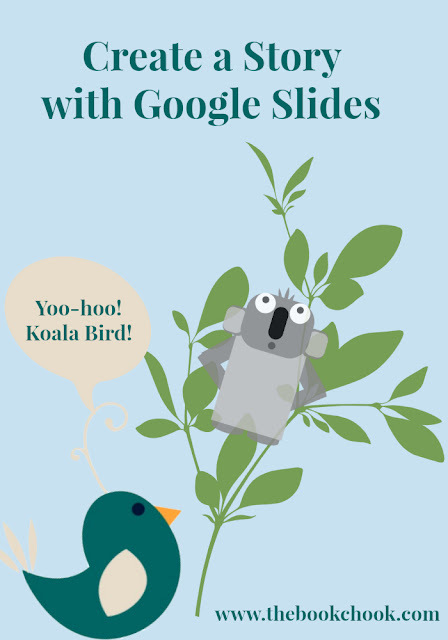 Google Slides would be a good presentation tool for something like a short poem, a short graphic story, a cartoon, a joke, or a collection of illustrated sayings, similes or metaphors. Younger kids could try innovating on a known text like I Wish that I Had Duck Feet or Mrs Wishy Washy, or a repetitive song like The Ants Went Marching. There are some examples of Google Slide stories and extra resources on this page at Control Alt Achieve. For more inspiration, check out my Creative Prompt series. You might also like to read Creating Picture Puzzles - Seek and Find.